Whether it’s bird, leopard or elephant watching you’re after, sightseeing, surfing, or sunbathing, we will cater for your favorite activity. All tours run from the Galaxy Lounge and range from half day trips to overnight stays. Please note that while Galaxy aims to find the best safaris and trips for its guests, we do not take commission and are therefore not ultimately responsible for the trip. We base our judgements on reviews from other guests and aim to bring to you the best that Arugam Bay has on offer. Prices are an approximate guide and subject to change. The jeep seats up to 6 people and costs approximately Rs12,000 to hire for the day. You will leave Galaxy around 6am and travel 1hr to Okanda where you will need to pay the park entrance fee which costs approx. Rs2000 per person. We can provide you with a food hamper that costs Rs1000 per person. In Okanda you can visit the Hindu temple and the Buddhist Monastery. The beach at Okanda is good for surfing. You will drive through the park until you reach the bird sanctuary at Kumana and the river which divides Yala East from Yala West. It is not possible to drive through to the other side. The animals that you may see in the park are; elephants, crocodiles, leopards, deer, wild buffalo, wild boar, bears, birds, monkeys and jackals as well as the abundance of butterflies, dragon flies, bees, lizards and other smaller creatures. Visit the tranquil scenery of Pottuvil lagoon at sunset. Watch out for the crocodiles hiding in the mangroves. See the amazing bird life fishing for their supper. Catch the crocodiles having their midday sunbathe! 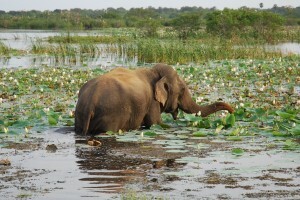 Visit Lahugala at sunset and spot the large herd of elephants. go surfing or wildlife spotting. There are many places to hire surf boards in Arugam Bay. Approx. Rs800 – Rs1000 per day. We can put you in touch with reputable surf instructors. Visit a working tea estate up in the hills between Ella and Badulla. Take a walk to the highest point and look down on the Ella gap. Be a guest in the manager’s bungalow for only Rs6000 full board for 2 people sharing. Taxi from Galaxy Rs11,000 for a one way trip. Learn to swing with our resident jive teacher P. You will find him at the Galaxy reception desk. This is our most highly recommended activity. It is included free of charge in your stay at Galaxy! The Galaxy beach is peaceful and undisturbed. Have a sunbathe or a refreshing swim, a swing in our beach side hammocks or a siesta on our comfy lounge cushions. We also encourage non-resident guests to come and visit our restaurant, sample our delicious menu and while away the hours soaking up the sun to the sound of the waves.